So almost two years go I bought my first camper, all ten feet of it. Rob and I were enthusiastic but anxious–would we use it? Could we tow it? Would it smell odd? I did not believe the nice woman at Fine Design Camper Sales who told me she was selling me my “starter camper.” I thought we’d be lucky to get our money’s worth out of it. Well, I guess the joke was on me. Not only did we enjoy camping in it, I also sort of fell in love with the whole vintage trailer scene. Fast forward to today…when the very same Sherry sold me my second one! Can you tell Worth loves it as much as I do? It’s a 1967 Yellowstone. It needs work, which you can be sure you will be reading more about. It contained the paperwork from when it was new, including this awesome old sales brochure. I can’t wait to repaint the faded turquoise stripe on mine! (This one looks too classic to do anything too creative with the paint.) 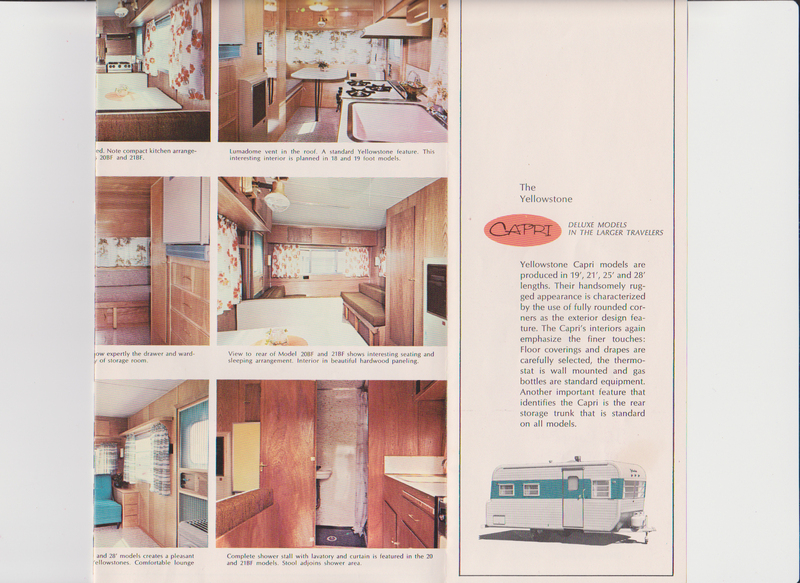 The interior of this little 14-footer looks just like the photo on top, but, you know, with forty-five years of wear to the birchwood and fixtures. Again, I can’t paint over the inside but I am looking forward to restoring the wood and having fun with new fabrics. This one has the original aqua appliances. Sweet! And am I wrong, or is that actually me in the bottom corner picture with the baby in the stroller? I think it might be. We’ve just now been reunited. Fun times ahead! As the brochure says, “From the compact fourteen foot to the spacious twenty-seven foot, there’s a model to suit almost every wish plus a travel trailering promise of happy, carefree times.” Indeed! Great post! I love vintage trailers. Thank you! I was enjoying looking at the pictures of yours too! Looking forward to the retoring and then the adventures of RRD&W in yr newrolling home! 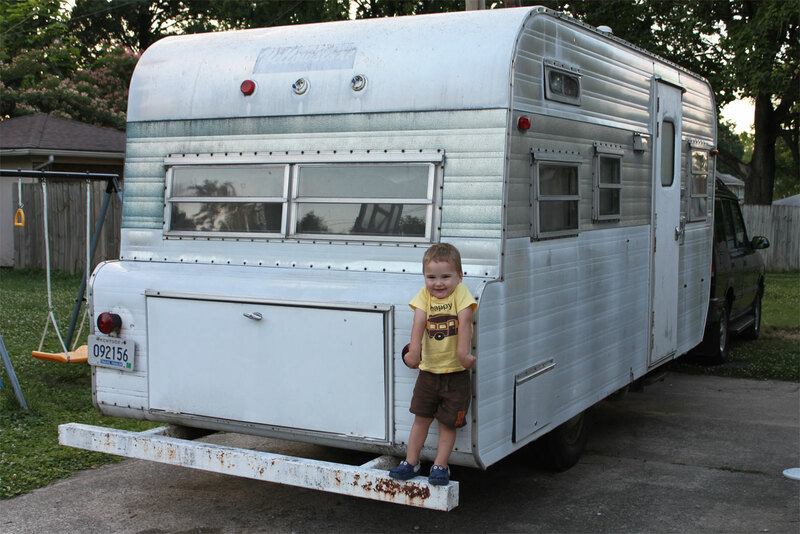 It is adorable, I love tiny trailers too! I can’t wait to see your progress 🙂 Best of luck and have fun….. I have a 1970 two-door, gold-striped version (as pictured above) that I’m in the process of demolishing right now. 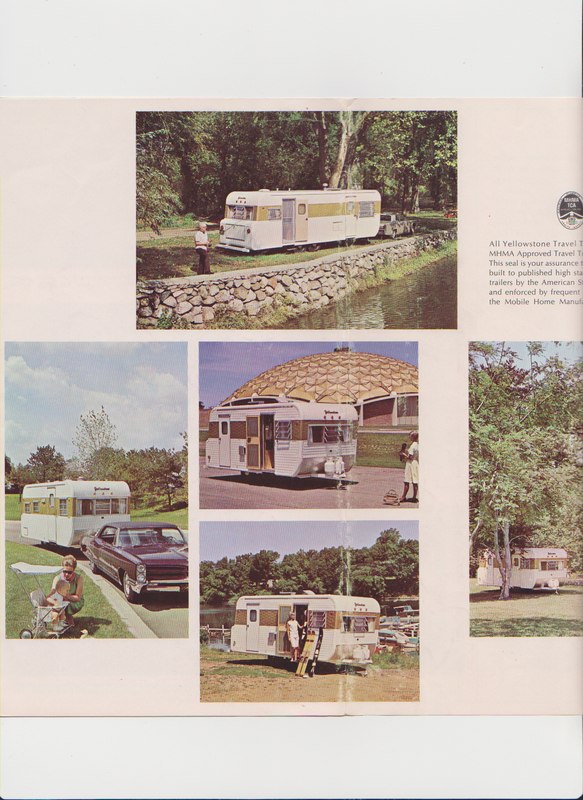 I agree, once you get vintage camper fever… you’re done for. LOL Mine, unfortunately, needs a lot more help than yours did, it seems. I have an original 1968 Yellowstone that is in great shape. It looks exactly like the one you had. Was going to paint inside but haven’t decided. I want to find out about my frig. Never used it but use heater. All is original inside down to handles. NOT cushions!! Had to do away with those. The people who bought mine said when they hooked up the gas the old fridge worked! Good luck with yours!